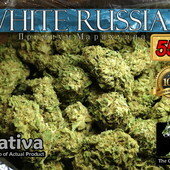 White Russian combines AK-47 with the White Widow to produce a snowy plant with a pleasantly sweet aroma and a strong, clear high. lol. Call now and order..408-658-8948 . Peace ya all. this strain is very powerful with a high THC content. Great for those who need pain relief during the day and need to get things done. Nugs were covered in what looked like snow. After a closer inspection I found the remains of many a Trichome. Almost looked like powdered sugar. Smoke was sooo smooth I felt high as a kite within mere minutes. Quite the pleasant smoking experience.